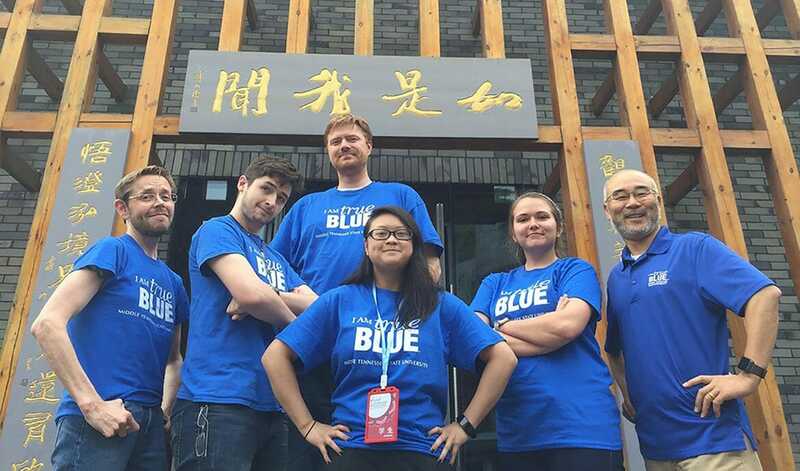 MTSU animation students are back home with some hardware after using hands-on teamwork, technical skills and creativity during the second annual Wonderful World: 2018 International Students Ocean Short Film Exhibition held in Guiyang, China. Kevin McNulty, an associate professor in the Department of Media Arts, and Dr. Guanping Zheng, director of the Confucius Institute, traveled with MTSU students Ryan Barry, Colleen Green, Shaun Keefe and Chi Nguyen in May to the international public service initiative that began just one year ago. Dr. David Schmidt, vice provost for International Affairs, attended the opening ceremony and gave the keynote speech. Language and cultural barriers made communication difficult, but the students found a way to create, shoot and edit a 30-second piece within the given 24-hour time frame. Each piece was different, ranging from narratives to documentaries to experimental films. MTSU has been officially invited to participate in next year’s exhibition on the topic of animals. Billy Pittard, chair of Department of Media Arts that houses the Animation program, is supportive of the endeavor. McNulty is continually motivated by his students’ teamwork. For more information on the Animation program at the Department of Media Arts, visit www.mtsu.edu/mediaarts.